with a definitive beginning and ending. at Midnight from 2000 to 2003. PROJECT COMPLETE: April 14th, 2003 C.E. Unicorn Jelly continues, as a film noir side story that takes place in the same universe. Now features a special dedicated Alternate Universe archive! A wonderful community of friendly, intelligent, and kind people! THE BEST OF THE UNICORN JELLY FORUM -Reprinted Questions and Answers! Contains some of the most extensive background information on Unicorn Jelly Available...if you have questions about the details of the Unicorn Jelly universe, they are probably answered here! An encyclopedia of the words, terms, places, things, and details about the universe that Unicorn Jelly takes place in. Here you can find definitions, explanations, and pronunciations of many of the things you will come across as you read Unicorn Jelly! The ULTIMATE map of the locations, places, and entire cosmos where Unicorn Jelly Takes place! Find out where everything is, and what it is in relation to. Features COSMIC ZOOM action! NOW in animated or manual control versions! The complete rules and play guide to Taasen, as played by the human inhabitants of the Tryslmaistan universe. An exploration of the foods, and the traditional recipes of the Gryrnese people. Discover Gryrnese culture through the medium of food! Happy fun linking button excitement making thrilling enjoyment of linkage! A free,original,card-tile based game for download and printing in your own home. All rules and instructions included! The fans of Unicorn Jelly are astonishingly talented. Come see what they have created! Free downloads of Unicorn Jelly software trinkets and goodies for your amusement! Includes Desktop poster art, sound files, game mods, cursors, icons, and more! Wild cubist paper model kits of the Unicorn Jelly characters that you can download, print out, and build yourself! The Unicorn Jelly Saga is over; the Epilogue is over too. But we have years of panels that were never used: flubs, bloopers, on-set practical jokes and more, in the Unicorn Jelly OutTakes Reel! See the cast of Unicorn Jelly as you have never seen them before, flubbing their lines and missing their cues! These are the same OutTakes shown at Unicorn Jelly cast parties and season wraps! Written by the members of the Unicorn Jelly Forum, this parody is now a comic! Fully illustrated by Jennifer. Unicorn Jelly's unique retro-pixel style is the product of drawing an epic story pixel by pixel using only a mouse, massive labor, and an ancient DOS paint program. Here is how it was done. If you are having trouble understanding what Unicorn Jelly is actually about, here are some answers for you. This article will let you pick the answer that best suits your personal tastes! Other works unrelated to the Unicorn Jelly saga that you might find interesting for a number of reasons. Includes Kamishibai works! Jennifer's personal central homepage site for all of her various creations, thoughts and explorations. Pastel Defender Heliotrope is a story that has roots in the Tryslmaistan of Unicorn Jelly, and sometimes explores the real history of the First People, and the fall of 'Myrmil', so important to the saga of Unicorn Jelly. If you liked Unicorn Jelly, there is more to learn about Tryslmaistan, in the backdrop of a whole new story. Pastel Defender Heliotrope follows a splinter group of Tryslmaistans thrust into the Cosmos of Pastel. Along the way, the value and meaning of being alive,of having power, and of being human will be explored, as well as the key remaining questions about Unicorn Jelly! If you liked Unicorn Jelly, you will love the fully hand-painted Pastel Defender Heliotrope! To Save Her is a new story set in the Unicorn Jelly universe of Tryslmaistan, among the infinite Alternate Universe splays. Follow the adventures of an alternate Kay-Wai as she risks everything to save the most important person in the history of the Tryslmaistan cosmos! You can help support Unicorn Jelly! Please help me keep Unicorn Jelly online! Contains the entire Uncorn Jelly saga, plus all supplimentary materials, plus additional materials in one very thick, single, high-quality, super-slick volume. The Unicorn Jelly Book is currently being publised through Lulu.com And can be ordered either online, through them, or by special order through your local chain bookstore, such as Barnes and Noble, or Waldenbooks, or other fine outlet. 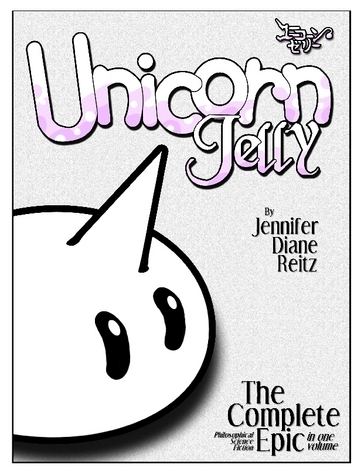 ORDER THE UNICORN JELLY HARDCOVER BOOK NOW ! ORDER THE UNICORN JELLY PAPERBACK BOOK NOW !